Heavy Cream isn’t just for strawberry shortcake! 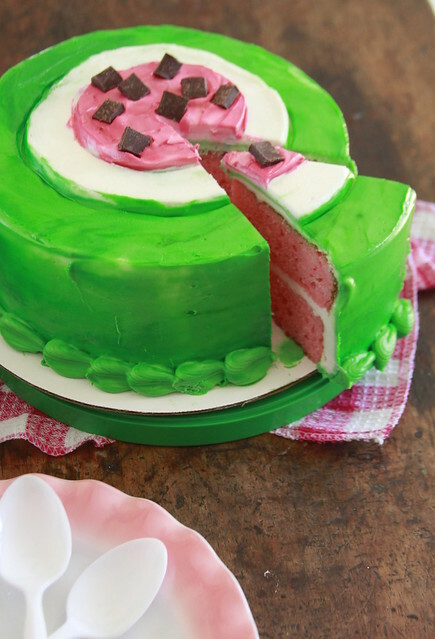 This Heavy Cream Watermelon Cake only uses the fat from cream to create a silky cake crumb. 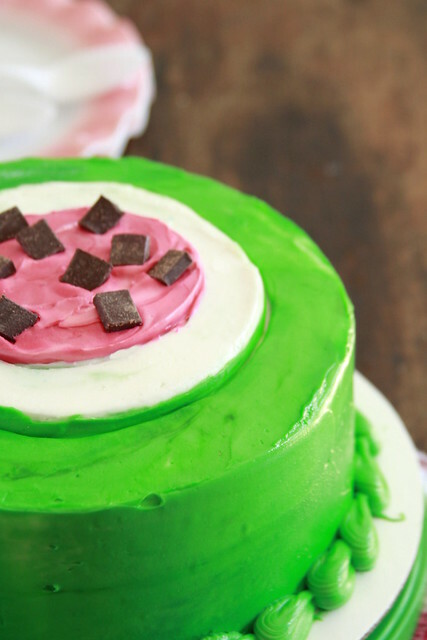 Decorating the cake with festive watermelon flare makes it the centerpiece of any summertime get together! During the summer, I feel like heavy cream becomes a one-hit-wonder. This rich dairy is destined to become whipped cream. Dolloped on berries, shortcakes, and angel food cakes—heavy cream has that predictable trajectory, the same way that a college girl makes bad decisions on her spring break in Miami. It’s so, how can I put it, blah? Yes, whipped cream is very blah. So here this Heavy Cream Watermelon Cake is to the rescue! It revitalizes heavy cream in a new and refreshing manner! What no butter? No oil? No fat? Exactly. This cake sounds like it shouldn’t work, but it does. It’s always fun to stumble across an odd recipe that refuses to be categorized into any specific cake camp. Don’t think this is a diet cake. 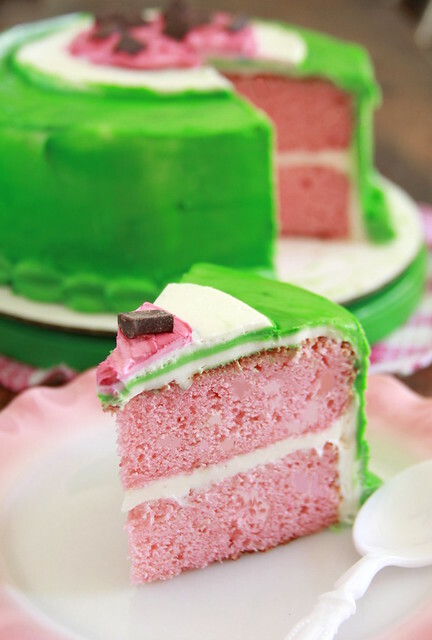 The Heavy Cream Watermelon Cake uses a decent 2 cups of heavy cream. There’s fat in the cake, it’s just in an alternative form! 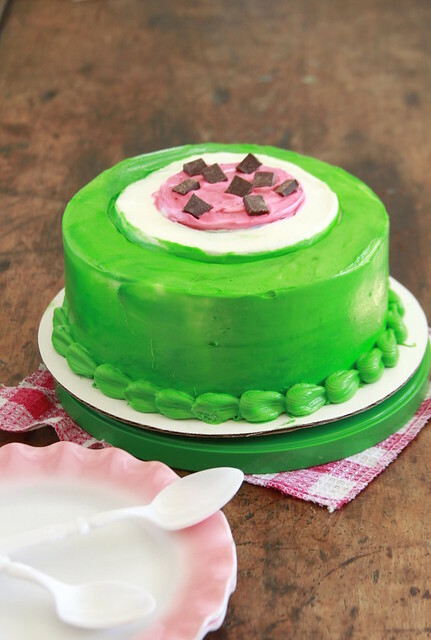 I decorated the cake like a summertime watermelon. Piping the frosting in circles while moving the cake stand makes for an even circle. You can paint on black seeds, but I went with chocolate chunks as the watermelon seeds. So blaze a new trail away from boring whipped cream with this Heavy Cream Watermelon Cake! Preheat oven to 350 degrees F. Grease two 8-inch cake pans with baking spray, set aside. Sift flour, baking powder, and salt in a large bowl, set aside. Beat eggs in a stand mixer on a medium speed until slightly thickened, about 4 minutes. Add sugar and vanilla, continue to beat for another 2 minutes. Whisk red food gel into heavy cream. With the mixer of low, add dry ingredients in three additions and the heavy cream in two additions, beginning and ending with the dry ingredients. Use a rubber spatula to scrape the sides and bottom of the bowl. Divide batter between both pans and bake for 30 to 35 minutes, rotating halfway. A toothpick inserted will come out barely clean with a few sticky crumbs. Do not over bake this cake. Let cakes cool in pans for 5 minutes before inverting cakes onto a wire rack to cool completely. Wrap in plastic wrap and refrigerate until ready to assemble. In the bowl of a stand mixer fitted with a paddle attachment, beat butter on medium-high speed until fluffy and pale in color, about 3 minutes. Scrape the sides and bottom of the bowl. Add the powdered sugar, followed by cream, vanilla, and salt. Raise speed to high and beat for 2 to 3 minutes. Tint ½ of frosting green and ⅛ cup of frosting red, keeping the remaining white. Refrigerate until ready to use. Welcome to Layer Cake Parade! Hello I'm Victoria. Lover of layer cakes, baker, recipe developer, and food stylist. I want to parade heritage and modern cake recipes on this website.